As the most exposed part of your house, your roof endures lots of wear and tear over the years. To guarantee its longevity, it’s vital that problems with your roof are identified quickly so that roof repair can be carried out to prevent the problem from worsening. Common roofing issues include; slow seeping leaks, leaking roofs, moss, woodworm, dry rot and damp. In this comprehensive guide, our experts will describe how to identify roofing problems easily and how to solve the most common roofing problems. Depending on the severity of the damage, a leaking roof can be fixed by an expert roofing contractor or by the homeowner themselves. Identification: To identify a roof leak, look out for water stains or black mould on ceilings and walls. Another sign is damaged, disturbed or slipping/loose tiles, defective flashings, or cracked flat surfaces on the outside of your roof. Noticing you have a leak is important, but discovering the location of the leak is more difficult; the leak may be coming from several different sources. To ensure the source of the leak is correctly identified, it’s advisable to hire an expert company, such as TCK Roofing, to survey the damage. Professional roofing contractors can repair a leaking roof and will also be able to identify other areas of the roof that need attention. If you prefer to fix the leak yourself, please be aware of the risks. This venture can be extremely dangerous and could result in accidents or serious injury when undertaken by non-skilled people, which could also further damage the property. Parts of the roof may be loose, slippery or weak underfoot, and walking atop your roof could expose you to unbalancing gusts of wind. Full safety equipment should be used correctly at all times during work to protect the safety of people and property. Be aware that the contractor is not insured if carrying out works in an unsafe manner. The property owner is also at risk if they allow works to be carried out in an unsafe manner and without the use of required scaffolding or safety equipment. It is highly unlikely that the property insurance would not cover for any accidents, injuries or inferior work. The property owner has the responsibility of making sure that the contractor is fully insured and fully complies with all Health & Safety regulations during works. You can remove moss from your roof either by using gentle brushing or a moss killing chemical. Specialists can also be hired to assist with extensive damage. Identification: Moss on roof tiles can be problematic and over time can damage the structural integrity of your roof. 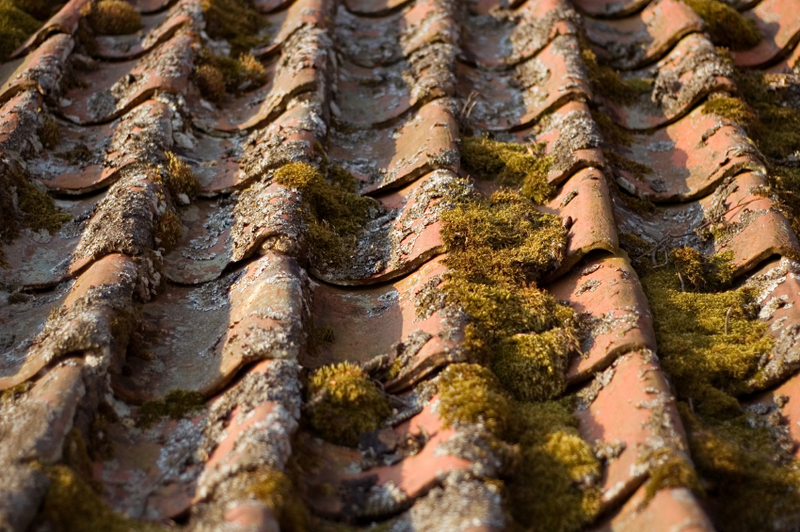 The absorbency of moss means that it can cause wood to rot if moisture enters below your roof tiles. It can also break away and block your gutters, which may disrupt your water flow. Moss on your roof can sometimes be identifiable from the ground, so make sure you’re regularly glancing up at your roof to check. Power washing your roof can potentially cause further damage. Instead, try gentle brushing with a long handled brush, but take care when walking on your roof. Roof moss removal can also be achieved by using chemicals. Homeowners should be aware that these chemicals can dissolve into rainwater and contaminate groundwater, so be wary of the surrounding garden environment if choosing this method. A thorough roof cleaning is offered by specialist roofing companies, who can carry out moss removal safely and efficiently. Woodworm is the collective name for all wood boring insects which can attack timber elements of your home. Through a process of laying, hatching and boring, these insects compromise your roof’s structural integrity, and will need speedy identification and attention. Identification: If you’re noticing lots of little holes peppering the timber structure in your attic, you may have a woodworm problem. You should first determine if the infestation is active by looking for any fresh borehole dust. TCK Roofing can help with identification if you’re unsure. Insects can only survive if their conditions are moisture-rich. If your attic space is damp, this could be contributing to the problem. However, if the wood feels relatively dry and has only just been installed, the insects may die off naturally, especially if you keep your home dry and ventilated. Insecticides are a possible answer. Remember to use protective gear during treatment, or hire out a professional. If parts of your roof timber have become structurally weak as a result of persistent, extensive woodworm, you should hire the services of a contractor who can get rid of the woodworm-riddled timber and replace it with new, treated timber. To treat dry rot, the source of moisture should be removed and any damaged timber components replaced professionally by a trusted roofing contractor. Identification: What is dry rot? A form of fungal decay that, despite its name, actually requires timber to contain at least 20% moisture, thriving in hidden away, poorly ventilated areas. Symptoms of dry rot include timber which is crumbly and brown, that is covered in white fluff or the presence of a fruiting, fungal body growing on the wood. An expert surveyor, such as from TCK, who are an approved damp timber treating and tanking specialist contractor, should first assess the extent of the damage and determine whether the infestation is active. Dry rot treatment generally involves drying the affected area, along with eradicating the source of moisture, application of fungicidal treatment, and ensuring better ventilation in the future. Some timber and brick components may have become dangerously weakened by the dry rot, and therefore our specialist team will need to replace the damaged wood with treated timber. Treating roof damp often requires professional attention, as the problem can be complex to fix. Identification: Mould or wetness of your walls or ceilings is a sure sign of damp. Locating the source, or sources, of the moisture is vital. Hire out a professional to help, as lifting of skirting boards or wall plaster may be required, in addition to an expert opinion. To remove damp, several steps have to be taken, and cases will differ depending on the severity. Initially you should try and remove mould with cleaning products before treating the cause. Once TCK have assessed the problem, our professionals can inject a damp proofing liquid into the masonry, fully impregnating the wall. This will also form a chemical barrier to stop rising damp in its tracks. Any walls will then have to be re-rendered. If you’re looking for comprehensive damp, dry rot, woodworm and roof leak treatments, the experts at TCK are with you every step of the way. As a family run company with almost 50 years’ experience and vast roofing, building and dampness knowledge and skills, we can identify, treat and repair roofing issues with a trained eye, as well as installing treated timber to prevent future issues. We also provide an emergency roof repair service. TCK offer our services across the North West of England, West London and Herts – get in contact by calling 020 3124 1983 today or get in touch online to arrange your free, no obligation survey – unless the property is for sale on the market. See our property inspection/reports.